There is a point where a band can evolve from a regionally identified indie folk rock band to that of a mainstream pop group. For The Decemberists, whether for good or bad, such an evolution is currently underway. The Decemberists had been a relatively high profile band but chose to abruptly drop off the radar in 2011. It was understandable due to a health crisis experienced by the band’s indispensible accordionist and multi-instrumentalist, Jenny Conlee. With the release in January, 2015, of their long awaited full length album, What a Terrible World, What a Beautiful World, Conlee and The Decemberists are now healthy for the rigors of performing and touring. The Decemberists originated in Portland, Oregon. The band’s name was inspired by the Decembrist Revolt, an insurrection in Russia in 1825. In 2000, Songwriter/Frontman Colin Meloy, who had recently left his band, Tarkio, migrated from Montana to Oregon. Both Query and Conlee were members of the group, Calobo, and through Query, Meloy was introduced to Jenny Conlee. The three created a score for a silent film together then joined Chris Funk, who at the time was their unofficial guitarist and a fan of Tarkio, and enlisted drummers Ezra Holbrook, then Rachel Blumberg. John Moen has been their drummer since their third album. The Decemberists’ musical style is very lyrical with the elements of whimsy and fantasy playing a large role in their artistic sensibility. As a seasoned musician and an excellent accordionist performing with an ensemble, Jenny Conlee knows when to alternate between using restraint and showmanship. To blend with the other musicians is fundamental, but not to the point where her presence is perceived as nonexistent. The goal is always to emotionally connect with the listener and to know what the music needs at that moment. The remoteness of the recording studio is a common challenge and a live performance is critical to show where that connection lies. Live shows are also fun for the audience and The Decemberists, who often involve the audience as participants in reinactments of historical events. “Down By the Water”, from The King is Dead, was nominated for the 2011 Grammy Award for Best Rock Song. Meloy made good use of the hiatus and became a published children’s book author while Query, Funk, Moen and Conlee were involved with a side project, the band, Black Prairie. 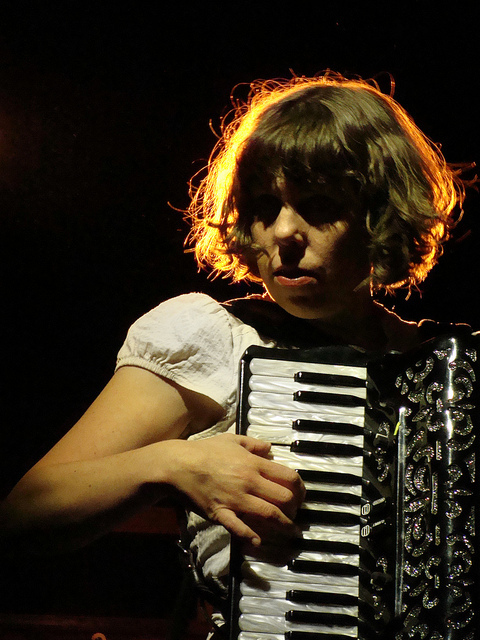 Jenny Conlee’s abilities as an accordionist, organist, pianist and “occasional back up singer” were featured as guest artist on several records. Artists and groups include Reclinerland, Lewis Longmire, Jerry Joseph, Buoy LaRue, Casey Neill & The Norway Rats as well as a collaboration between The Decemberists and The Minus 5 in “Killingsworth”. Jenny Conlee also appeared in Portlandia in comedic skits with Fred Armisen and Carrie Brownstein.